Never have I been so impressed by a place as I was entering Burma (also known as Myanmar) for the first time. The trip was especially significant on a personal level, as the week prior Aung San Suu Kyi had been to the University of Oxford and was honored at Encaenia with her honorary doctorate in civil law from her and my alma mater. I wanted to see where “Daw Suu” came from, to see what inspired her to keep going through such a dark period in Burmese history. What I found in her country was a proud people of noble character, eager to learn what the “outside” world was like after decades of privations without any of the modern conveniences we take for granted; clean running water, electricity, the internet, mobile phones, bank ATM’s. I had no idea I would be so moved by a monument in the city of Rangoon (also called Yangoon) which stands for the good that the Burmese Buddhists pursue in their humble daily lives. 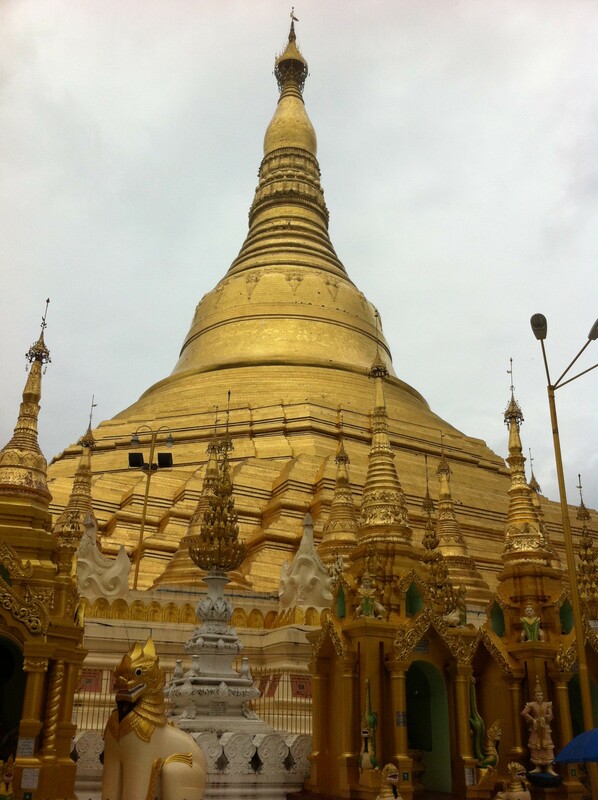 The Shwedagon Pagoda is a bright, shimmering beacon in a country with a long history of colonial and military subjugation. 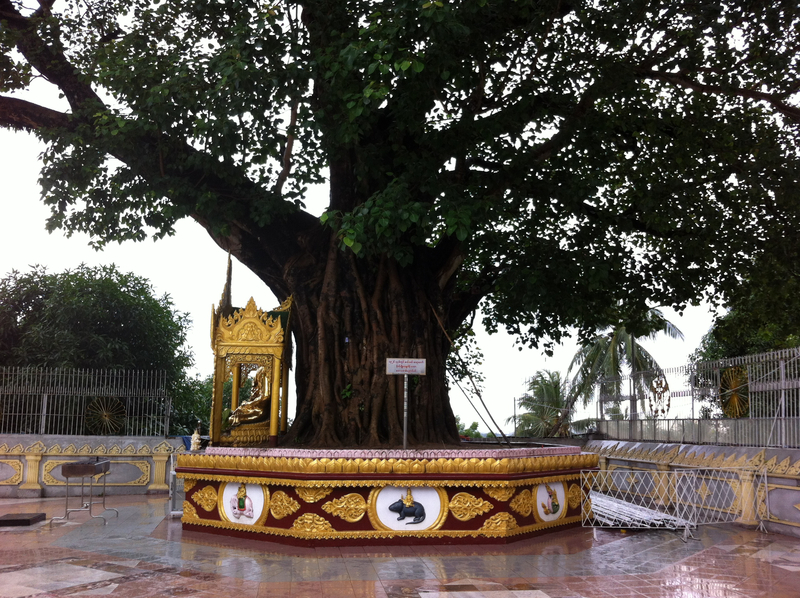 It has provided the faithful of Burma a place of pilgrimage and meditation during some of its darkest hours as a country. Indeed, it was from the back seat of a taxi as my driver carefully maneuvered through the early Friday evening traffic to my hotel, that I first set eyes on the shimmering monument. As we passed the base of the historic site the famous bell shape was visible in the distance atop a hill that dominates the cityscape. As Maugham noted, it truly glistened in the final rays of sunlight, reflecting the brilliant pink sky all around, a sight I will never forget. The driver offered to return the following day when we could get a look close-up, and he would provide his services as a tour guide. Access to the upper level of the pagoda is through one of four covered stairways at the north, south, east and west axis points. Visitors normally climb up the south stairway to begin their visit at the terrace level in a clockwise direction. (3) Climbing the covered stairs to the main pagoda terrace is an act of contrition in itself. While climbing hundreds of steps one has ample time to contemplate one’s sins. Upon arriving at the terrace entrance to the pagoda after a torrential three-hour downpour in the morning, the number of visitors was surprising. The slippery terrace (paved in European marble) proved no obstacle to the barefoot faithful. The Burmese Buddhists are a very devout group. I was informed by my guide that many of them would have arrived during the downpour to sit and meditate in the covered pavilions along the terrace that surround the pagoda. Along the terrace at the base of the pagoda are beautiful ornamental tazaungs (pavilions for rest) and zayats (prayer pavilions), and mandapas, or open buildings “used to shelter revered religious objects such as the footprint of the Buddha or the holy scriptures.” (13) There are also shrines laid out according to the compass points and each housing offering points of the Nine Planet Gods that correspond to the eight days of the Buddhist week. According to their calendar the eighth day is made by dividing Wednesday into two parts: morning and afternoon. 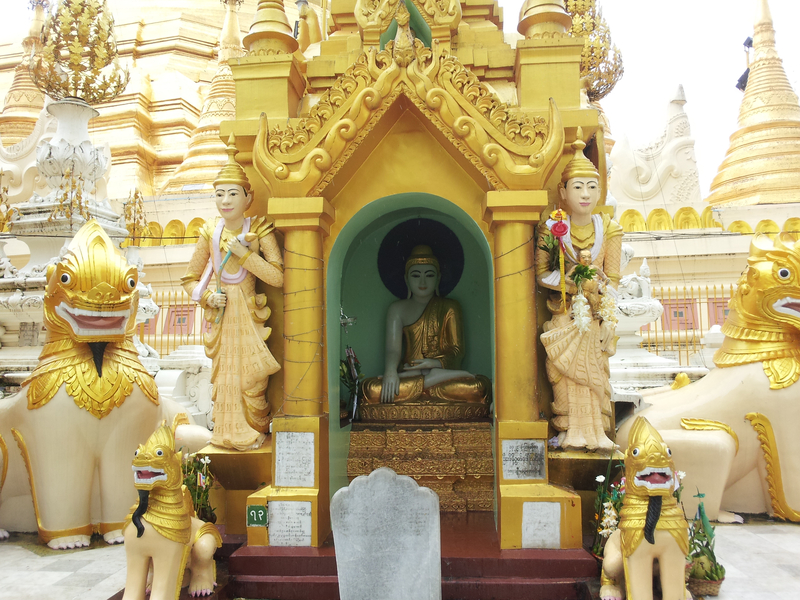 At Shwedagon the guardian spirits are represented by planets and animals. The ninth point is the bell shaped pagoda housing the sacred eight hairs of Buddha in the center of the compass point. 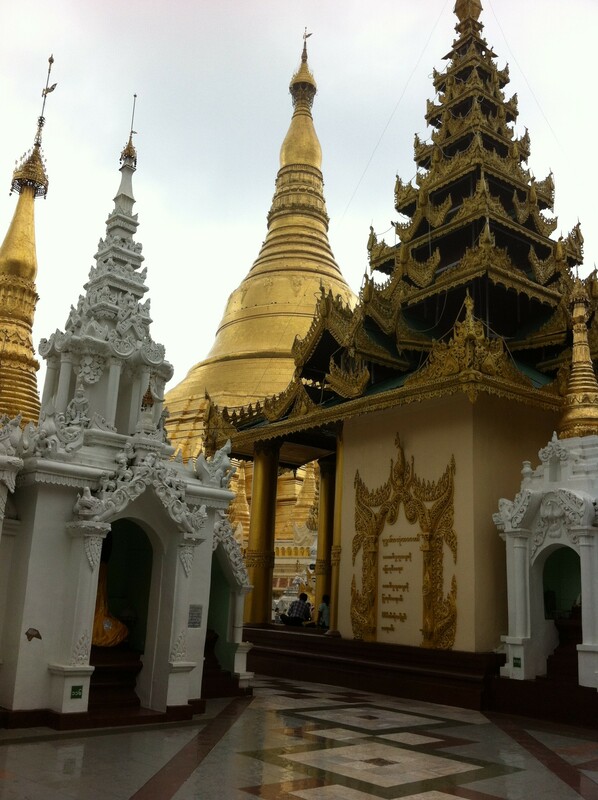 (14) A Buddhist visitor to Shwedagon can make merit in two ways in connection with the Nine Gods. The faithful continue by chanting sacred verses. The final act of homage includes the sprinkling of water at the base of Shwedagon. This will help ensure that merit is made to appease the spirits. Finally, after casting the holy water one must strike on of the large bells hung along the balustrade of the terrace. This will alert the gods and humans who hear it to “utter an Amen thereby receiving a share of the merit”. (16) The thought is that the Burmese strike the bells at the end of their worship to share the merit they have made with others there for the same purpose. The white stucco and gilded shrines that are placed along the terrace at the coordinates of the compass points create a sort of buffer to the pagoda that rises up just behind them. The overall effect of gold, marble, stucco, jewel colors and carved fretwork is inescapable. Taking in its beauty as a monument, those who make the pilgrimage will be amply rewarded for having made the effort to get there. Even a non-Buddhist would find it hard not to appreciate the sacred beauty of the monument and its historical significance in a country that has, until recently, been so isolated from its neighbors in the region and the rest of the world. One can only hope that the changes being wrought on the country in rapid succession do not overshadow or destroy the real Burmese traditions and faith that have managed to persevere. Thankfully, the Shwedagon pagoda’s future is ensured as it is one of the most sacred pilgrimage sites for all Buddhists.